Human rights are human rights, no matter what country you're in. If someone feels a cause is important enough to protest or fight for, good for them. CBear3 wrote: I honor those at Tienanmen Square for standing up for their rights in their country. If those were Americans doing it I'd think they were stupid and feel bad for their families, but not necessarily them. When they're ready for a change it will happen from within. Pretty scathing column in the WaPo from last week. The choice is an ugly one: Removing the Games at this late date would devastate Russians who have invested national self-worth in them, and the athletes who have trained for them. Therefore the only option is to watch Sochi become a contest for prestige between two warring parties: a corrupt strongman who wants to flex his political authority, and the murderous jihadists who have vowed to strike in Sochi. Why should the Olympics lend its prestige to either? But that’s exactly what’s happening. Bribery is the logical explanation. I'm probably more worried than I should be but I'm pretty skeptical that there will be no major acts of terrorism during the games. PensFanInDC wrote: I'm probably more worried than I should be but I'm pretty skeptical that there will be no major acts of terrorism during the games. The scary thing is that some people that probably qualify as experts seem to agree with you. So am I, tbh. We're terrible humans. columbia wrote: Bribery is the logical explanation. Now that I've thought of it some more, it's probably extortion. Capturing enough "deciders" from the IOC on tape, in a compromising position with a 14 year old girl (or boy) would be much cheaper. Not sure if anyone remembers the bid scandal when the IOC awarded the Salt Lake City games. The IOC has a history of impropriety as there were also allegations related to the 1996 and 1998 games. 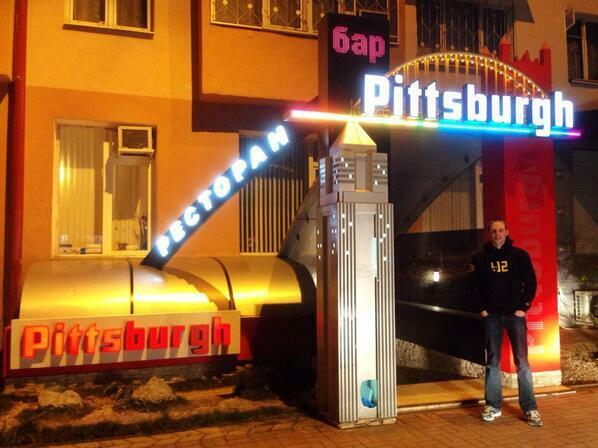 So apparently there is a bar called Pittsburgh in Sochi. I'll post a pic when I get home. I can't get to Twitter from work, or I'd post it now. llipgh2 wrote: So apparently there is a bar called Pittsburgh in Sochi. Looks like its in an apartment building. DK will be so proud. Dickie Dunn wrote: Looks like its in an apartment building. The banner on the light pole notes it is indeed a bar. No terrible towels hanging from the window? No visible speakers piping that "Here We Go" song? I thought this was a Pittsburgh bar. Here is the first pic I saw of it. Maybe a member of the Russian Penguins Fan Club, which I think would make him anything but a mope. Gaucho wrote: DK will be so proud. DK's Pittsburgh observations and cheerleading really make me miss home. He posted another pic on Twitter of the interior. Other than a really nice skyline shot of the burgh hanging in the background, not much Pittsburgh-ness to it. I will add the interior is nice.